It's January 2 and a Friday, so of course my Friday Lunch Club - four people who used to work in the same bank - got together to do a proper kick-off of 2009. 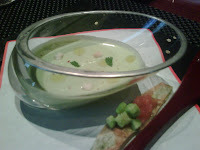 We decided to do this at L'Atelier de Joël Robuchon. I haven't been back to L'Atelier since being on the receiving end of some ridiculous service 2 months ago, and it would be interesting to see how things would go today. We sat at a bar table for the cheaper set lunch. Being a Friday when no one is in the mood for work, we decided to order up some alcohol. I chose of bottle of Billecart Salmon Rosé NV as a more interesting alternative to Dom Perignon, Krug or La Grande Dame. The wine was very smooth and round on the palate, but I found the nose wasn't as open as I had hoped, with some raspberry and toasty notes. The amuse bouche sent by the chef was very interesting. It was a bowl of coriander and cream cheese soup with croutons. It was rich and delicious, and reminded me of the dip used to accompany Indian poppadoms - but without the spices. My first course was the skewer of scallops and bacon. The scallops were pan-seared and decent, but slightly below my expectations. The bacon, however, was excellent as it was fatty and sandwiched between two thin slices of grilled red capsicum. 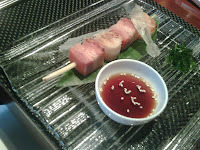 I alternated between tasting these "as is", with the teriyaki sauce, and with a bit of the mixed herbs. 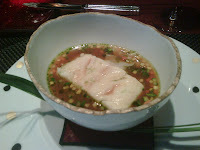 I continued the seafood theme by having cod fillet in seafood broth. I wanted to try to keep things "light", so I did not take the other heavier dishes which my friends ordered. The cod was indeed lighter and nicely done, although somehow today I felt that there was a little something missing. The broth, however, was really nice and full of flavor. I am sure they used prawn heads and shells to make the base. They also diced up broccoli, carrots, cucumbers and squash into tiny cubes for the broth, and placed thinly sliced cucumber "ravioli" inside. 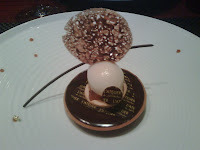 The chocolate caramel tart with pear sorbet was wonderful. I had a caramel and pear dessert at the Salon de Thé downstairs earlier in the week, and this was on my mind as I did the ordering. The sorbet was so nice...like eating a fully ripe Anjou pear, and there were small chunks of caramelized pear in the tart. What a great way to finish!